Assault on fellow citizens, by what right? Are you offended by the truth? Some of us are and choose to exercise our First Amendment constitutional rights in response. Unfortunately, another type of offense just took place in Atascadero on July 7 by another person who appears to be offended by the truth. Her response however, was quite different than ours. The offense, a criminal act, in violation of Penal Code 242: battery, took place on Curbaril Avenue overpass at Highway 101 when a middle aged woman, obviously offended by what we consider the truth written on our signs, drove past our constitutionally protected peaceful assembly on the sidewalk, and sprayed my partner and I with suspected pepper spray. She chose to violate the law, was apprehended by the Atascadero Police Department and was cited for the violation. CalCoastNews covered the story, contacting the offender who stated she was defending President Barack Obama from an unwarranted attack. It is interesting how the other political side of things interprets defending and attacking. Our presence on Curbaril Avenue does not in any way present a viable threat to the president, unless of course you consider what we have written on our signs, things like: “Benghazi Matters,” “Truth is not Hate Speech,” “Secure the Border,” “Stop Obamacare,” “Obamacare = Fraud,” “America is a Free Speech Zone,” and “Wake Up.” Quite the contrary to the real threat we believe this president represents when he willingly and knowingly violates current U.S. law. His violations include a disregard for current immigration law, which in large part is responsible for the current crises overwhelming our southern border, the unilateral release of five high level Taliban GITMO detainees without notification to Congress, the use of numerous federal agencies like the EPA, the IRS, HHS (the Affordable Care Act), and the DOJ to inflict real injury to honest hard working Americans, his cover-up regarding the facts relative to before, during, and after the Sept 11, 2012 terrorist attack on the U.S. consulate in Benghazi, Lybia where Ambassador Chris Stevens and three other brave Americans were murdered, U.S. Border Patrol Agent Brian Terry’s death in Dec. 2010 by a weapon tied to the failed “Fast and Furious” gun running scheme orchestrated by the Obama administration and a myriad of other, as the president says, “phony scandals”. We were attacked because of what we believe, and that is against the law. There are real threats to America’s safety and our national security, but our flags and signs are not. In fact, what we do is Constitutional and within the confines of current law. We choose to fly our flags and hold our signs peacefully in opposition to what we consider dishonest and unlawful behavior by our federal government. We choose to defend liberty, our nation and our fellow citizens lawfully in this manner. Our choice to stand up for the U.S. Constitution and the laws of our nation is not without risk or reward and we realize not everyone agrees with us. Our peaceful assemblies, however, only threaten to expose the dishonesty and the lawlessness that President Obama chooses to engage in. Why this woman perceives our presence as threatening to the president and in her view warrants her immediate physical assault on us is quite disturbing. Thankfully we are still a nation of laws. In closing, I want to thank the Atascadero Police Department for their quick response, professionalism and their ability to apprehend the offender within a very short period of time and within the confines of the law. Thank you. Aaron Armstrong is a member of Patriot Partners on the Central Coast, a non-affiliated group of people who love their country and are concerned about the behavior of the federal government and the future of the nation. The group meets on Tuesdays from 4 -6 p.m. at the Santa Rosa Street overpass in San Luis Obispo and on the first Monday of the month from 3 -5 p.m. on the Curbaril Avenue overpass in Atascadero. Armstrong can be reached at (805) 459-6743. Don’t forget to sue her for the tort of battery after the criminal matter is completed. Hit her in the pocketbook for the battery. It won’t hurt as much as pepper spray, but at least that will be a few less “bend over” or”bend forward” Obama bumper stickers she can buy for her Prius. First thing: What this woman did was wrong, illegal and immoral, period. To attempt to paint her as any sort of representative of anyone else on the left is disingenuous and a blatant attempt to demonize everyone on the left. This “lady” apparently had a breakdown, retreated into her own little world and took out her frustrations on those she disagreed with, and she should face the music for her actions. There have encounters, disruptions and fights breaking out at protests over the years that are shameful, and they have been caused by people trying to “stop” the message, and it has happened on both sides, politically. Go back and read about how anti-war protesters were treated during the Bush presidency; people being arrested for having a bumper sticker on their car or for wearing a particular t-shirt; there is no shortage of incidents that reflect badly. Again, this woman was wrong period, and she should account for her actions, but she is not a “representative” of what the left is about; I know this because I am on the left and would never impede someone’s attempt at protesting, and I would never attack or confront someone in this manner. You should be glad Obama’s president. When Bush was president, enacting the “Fast and Furious” program, which you blame Obama for, signing the law that prohibits deportation of minors from countries not contiguous with the United States, which you blame Obama for, and destabilizing Iraq, which you blame Obama for, you had nothing to protest against. I’m sure John Christopher Stevens wasn’t glad Obama is president. Almost as unhappy as he was with those Congressional Republicans who refused to increase the funding for embasy security, right? Or President Obama who turned a deaf ear when intelligence pointed to an increase in tensions and the Libyan embassy requested additional support, especially at the most critical time. Or all the veterans left out to dry and die while administrators got their raises and bonuses, thank you President Obama, and Secretary Shinseki. Conversely, I am sure that the family members of the 4500 plus service men and women that were needlessly killed, and the 150,000 plus Iraqi citizens, weren’t too happy about George W. Bushes fraudulent Iraqi war! If Bush didn’t get us into a FRAUDULENT war to begin with, we can only come to the conclusion that the Bergdahl soldiers and all the rest wouldn’t have been killed in the first place. But, that is not the case. The USA has to live with “W’s” killing mistakes. It takes time to clean up Bushes MISTAKES with the economy and the fraudulent wars he started, so sit back and be happy that we’re getting out of those countries and are not getting back in to save those that won’t even stand up for themselves. You don’t throw more lives at a lost cause because their many divisions of religious tradition will never change. You really seemed stuck on things from years and years ago, many people think we should not forget our past but it is better to spend energy on todays issues, and thanks to President Obama there are plenty of things that need corrected going on right now. But hey as soon as we get time machines working we look into going into the past to address any issues you feel need it. I have tried to introduce conservatives to the whole movie, but they think it’s a documentary. They were happier than the thousands that Saddam Hussein murdered. At least they died for a cause other than their political belief. Ted, The 150,000 Iraqis do not matter as they do not worship the Hebrew God. Thank your version of a God that its been 5 years now so George Bush can be “perceived” as being off the hook for his FRAUDULENT war in Iraq! “Laughing Out Loud!” Like I said earlier, it takes time to clean up “W’s” messes he left behind. To the irrational thinker and inept of actual facts, it was George Bush who signed the William Wilberforce Trafficking Victims Protection Reauthorization Act of 2008 which for the most part is responsible for the border crisis as it has turned out concerning the children! The Obama Administration under said law is doing what the law requires for better or for worse. Remember, Obama has turned back more illegals at this time than Bush ever did in his horrific eight years in office. Almost all Democrats voted for the Iraq War, before they didn’t and gave Bush the thumbs up to go in without giving him a time table to get out…which I believe they should have done, especially after they found Saddam Hussein in that Spider Hole. Also, it’s been proved THE Obama / Liberal Democrats have manipulated the data. Obama hasn’t turned back more illegals than President Bush. Ted Slanders said ” The Obama Administration under said law is doing what the law requires for better or for worse. ” If this was true, it would be the first time he has followed the law. However, just today, he returned 40 or so to Honduras with out a hearing. So, you can not have it both ways. Either he abides by the law and holds hearings or he deports them without hearings. As for your last statement, it is not factually accurate. A true statement would be BO has deported more illegal aliens than Bush did at this point in his presidency. However, Bush leads in the total number of those “returned” and since the number of border crashers has increased three fold, the percentage of those caught and returned as a whole lot less. I know it is just a word game, but let’s not play fast and loose with words. The number that brazenly storm our borders tells me that neither gave a hoot about border security. If they did, we would not be having this discussion. So does he also “own” the booming, all-time-high stock market? That of being born non-white. Oh, they’ll pitch and moan with their victimization and martyr pitty-pat dance; but that’s really what’s in their craw. They just can’t stand it that somebody ‘other’, someone not a pasty empty suit that they delusionally identify with , is in the WHITE House. Why they imagine some connection with weirdo’s and con-men like Nixon, Reagan, the Bush’s, McCain, Willard Romney, is truly strange. It must be easier than thinking. Liberals seem to have a really hard time with freedom of speech when the speech disagrees with their personal beliefs. The protesters had every legal right to protest. The crazy attacker is a criminal and should be prosecuted to the full extent of the law. The attacker should also forfeit all of her guns since she has shown herself to be unstable and likely to explode at the next act of protest against her beloved Obama. Yes, I’m waiting for Ms. Capps to announce that this criminal should forfeit her guns and knives, but something tells me she’ll be quiet as a mouse about this case. 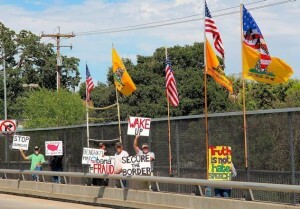 The flags, especially the Gadsen flags, affixed by poles to the fence are AGAINST THE LAW. The cops should have had these unruly, misinformed, lawbreakers disperse BEFORE any incident could happen; and if they didn’t, then placed in cuffs. It also seems unlikely that these whiners obtained a necessary permit from CalTrans before staging their ridiculously poor guerilla theater. You tried this before, saying the whole protest on the overpass was against the law, yet you can’t cite the law. STop making claims if you can’t back them up. Even if you are correct, she didn’t have the right to pepper spray the protesters. One thing leads to another, and overpasses are inappropriate and possibly dangerous places for protests or demonstrations of any kind. Some overpass demonstrators were once arrested and prosecuted for involuntary manslaughter when an uninvolved motorist was killed by another motorist distracted by the conflab. Further on, the article says the CHP has a right to stop a demonstration on an overpass if it is impeding traffic. You are not a winner except in your own mind, since you are guilty of making up your own facts to make your arguments. Look in the mirror and tell hotdog the same thing. So, what ‘truth’ did I bend ? I wrote that I agreed with Presiding Judge Scotland, but posted the website so that all could view the entire article. I think that was rather considerate of me. I am unconcerned about being a ‘winner’, but do try to be consistent. hotdog can make up his own mind, and I know that he does. Wasn’t aware you needed a permit to carry a sign on a public sidewalk. Can you state the regulation??? Likely not since it doesn’t exist. Isn’t it funny how the left is anti-censorship unless it’s the free speech of the right? What a simpleton you are. Screw everyone for expressing free speech unless its approved by you, isnt that how your kind functions?. Typical, its all good as long as its your way. If I approached Capp’s, in a vehicle, while she stood on the street and nailed her with pepper spray Id be arrested for terrorism, battery, assault,road rage likely. This Sociopath should be taken off the streets. What next from her, a road rage stunt over the curb to take out a few innocent Americans simply exercising their rights. Very good article. Sometimes the truth hurts and some people just can’t handle it without pepper spray. Please keep up the good work. I say toss her into the slammer with the other bad cats, where she may get sprayed too. I am astounded that anyone could be ARROGANT and STUPID enough to feel that it’s permissible for them to pepper-spray someone that does not agree with their political views. July 14, 2014 Bob Beckel, Democratic strategist on Fox News “The 5” says there is NO serious problems at the border and that all children should be let into the U.S. The other female hosts asked him if U.S. should open boarders to all the AFRICAN and Chinese children etc…And stated Taxpayers can’t afford all these illegals coming here. Beckel stated that America in not financially bankrupt. So I’m guessing all the LIBERAL thumbs down posters are willing to PAY for all these illegals with higher taxes.